For the past 70 years SA Greeting’s has been designing, manufacturing and distributing original and trendy social expression merchandise across South Africa. Being founded in 1939, under the name of Christian Publishing Company, the company has moved leaps and bounds in gaining its market position. The company opened a greeting card retail outlet in 1977, which transpired into the very successful Cardies chains across South Africa. The majority of these stores are now owned by SA Greetings, with a few stores franchised to very successful and loyal franchisees. In 1996 SA Greetings was sold to American Greetings Inc, and soon after this Creative stationery was acquired. This acquisition gave SA greetings a commanding leadership position in the industry. The latest milestone has been in October 2015, when all shareholdings were taken over by the executive directors and an overseas investor, Depesche. This opened a window of opportunity as the German based company’s world acclaimed Top Model range became available to SA Greetings to distribute. 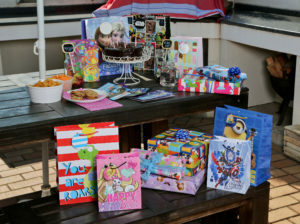 With three major brands, Creative Stationery, Carlton Cards, and Entertainers, the store division of Cardies, and continuous partnerships with key suppliers, the company has grown from strength to strength, ensuring that they remain South Africa’s leading brand for gift dressing and social stationery. With a wide portfolio range, from cards, stationery gifting, party and wrap accessories, across all seasons; SA Greetings ensures that every portfolio is driven by ambition, passion and innovation. With a dynamic in-house studio for both Creative Stationery and Carlton Cards, and dedicated Marketing team, SA Greetings ensures that variety and unique design is a key player in product development. From planners and sales teams, to pickers at our Distribution Centres these are some of the departments which make up what SA Greetings is today. Over 500 employees are spread across each of the three major provinces in South Africa: Kwa-Zulu Natal, Gauteng and the Western Cape. With our head office, and the home to Cardies Head Office, in Aeroton, Gauteng, and two distribution warehouses, in both Aeroton and Ladysmith (Ezakheni). The company’s disciplines include design, marketing, sales, ecommerce, supply chain, visual merchandising, technology, innovation and management. With over 140 years combined experience in the Social Expression Industry, both locally and internationally, our Executive Management Team consists of: John Charlton (Executive Chairman), Mike Turk (CEO), Willie Engelbrecht (CFO), Marlene Stroh (Sales and Marketing Director) and Rob Roodt (Ops Director).